Older studies document ureteral injury rates of as high as 30% during major pelvic surgery (44). More recent studies, however, report ureteral injury rates of less than 2% (Table 1). Many ureteric injuries may be asymptomatic, ultimately resulting in loss of renal function (44). Current guidelines recommend identification and tracing the course of the ureter during all gynecologic surgeries (45). Intraoperative consultation for a ureteric injury should involve assessment of both ureters and the bladder for potential injury. ■ If there is concern regarding a possible ureteric injury but none can be visualized laparoscopically, evaluation with cystoscopy with confirmation of ureteral patency is adequate. 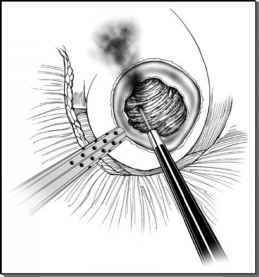 ■ If during this evaluation patency of a ureter cannot be confirmed, a ureteral stent should be placed. ■ If the pelvic ureter is obstructed, it should be repaired. However, prior to pursuing surgical repair of the ureter, the patient medical record should be reviewed for possible causes of prior urinary tract injury. ■ When the ureter has been obviously transected, laparoscopic ureteroureterostomy or reimplantation is an option (46,47). Typically, injuries near the bladder are reimplanted, and injuries higher in the pelvis are reanastomosed. Laparoscopic reanastomosis has been documented in a number of gynecologic procedures. A retrograde ureteral stent is placed, and four interrupted sutures are placed circumferentially around the ureter. We have found it helpful to place a single interrupted suture to align the ends of the ureter to facilitate stent placement (47). When a tension-free ureteroureterostomy is not possible, reimplantation in the bladder should be considered. This is often done with a bladder flap. Fibrin glue and laser welding have been used successfully to repair ureterotomy in an animal model (48). Another clinical scenario that occurs is injury to the ureter with an energy source but no ureterostomy. In this setting, bilateral ureteral patency should be confirmed. Passage of a ureteral stent in these cases has been reported with both successful and unsuccessful outcomes (49,50). Consideration should be given to surgical repair in these settings.